HER-SEN DOONG earned his doctorate in Information Management from National Sun Yat-Sen University in Taiwan and is currently a Professor of Management Information Systems at National Chiayi University in Taiwan. Prior to his academic career, he worked as a product manager in a start-up software technology company. 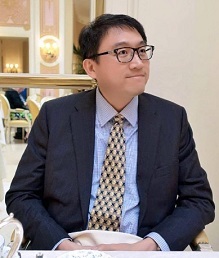 His current research interests are in the areas of innovation adoption and diffusion, human-computer interaction, and electronic commerce. His paper has been published in the Information & Management, International Journal of Electronic Commerce, Decision Support Systems, Psychology & Marketing, Electronic Commerce Research and Applications, Group Decision and Negotiation, International Journal of Information Management, Behaviour & Information Technology, Electronic Markets, Service Industrial Journal, Journal of Travel & Tourism Marketing, International Journal of Tourism Research, Journal of Air Transport Management, and Online Information Review. 1. Huichih Wang and *Her-Sen Doong, “Revisiting the Task-Media Fit Circumflex: A Further Examination of Negotiation Tasks,” Information & Management, Vol. 51, No. 9, 2014, pp. 738-746. 2. *Her-Sen Doong and Huichih Wang, “Exploring the Determinants of Citizens’ Intention to Participate in the Development of Electronic Government Services,” Lecture Notes on Computer Science, Vol. 8650, 2014, pp. 54-62. 3. Her-Sen Doong, Huichih Wang, and Rob Law, “An Examination of the Determinants of In-Flight Duty-Free Shopping: Hedonic and Utilitarian Motivations,” International Journal of Tourism Research, Vol. 14, No. 3, 2012, pp. 303-306. 4. Chih-Hui Hsiao, Huichih Wang, and *Her-Sen Doong, “A Study of Factors Influencing e-Government Service Acceptance Intention: A Multiple Perspective Approach,” Lecture Notes on Computer Science, Vol. 7452, 2012, pp. 79-87. 5. *Her-Sen Doong and Huichih Wang, “Do Males and Females Differ in How They Perceive and Elaborate on Agent-Based Recommendations in Internet-Based Selling?" Electronic Commerce Research and Applications, Vol. 10, No. 5, 2011, pp. 595-604. 6. *Her-Sen Doong, Huichih Wang, and Gordon R. Foxall, “An Investigation of Consumers’ Webstore Shopping: A View of Click-and-Mortar Company,” International Journal of Information Management, Vol. 31, No. 3, 2011, pp. 193-304. 13. Jeffrey C.F. Tai, Eric T.G. Wang, Her-Sen Doong, and Kai Wang, “Distinct Impact of Information Access Patterns on Supplier’s Non-contractible Investments and Adaptation for Supply Chain Agility,” Lecture Notes in Business Information Processing, Vol. 52, 2011. pp. 59-66. 14. Shu-Lu Hsu, Huichih Wang, and *Her-Sen Doong, “Determinants of Continuance Intention towards Self-Service Innovation: A Case of Electronic Government Services,” Lecture Notes in Business Information Processing, Vol. 53, 2010. pp. 58-64. 15. *Her-Sen Doong and Huichih Wang, “Predictors of Diverse Usage Behaviour towards Personal Knowledge Management Systems,” Online Information Review, Vol. 33, No. 2, 2009, pp. 316-328. 16. *Her-Sen Doong, Rob Law, and Huichih Wang, “Innovation Diffusion Modeling for Drawing First-time Visitors: The Case of Hong Kong,” Journal of Travel & Tourism Marketing, Vol. 26, No. 1, 2009, pp. 19-29. 17. Her-Sen Doong and Hsiangchu Lai, “Exploring Continuance of E-negotiation Systems: Expectation and Disconfirmation Approach,” Group Decision and Negotiation, Vol. 17, No. 2, 2008, pp. 111-126. 18. *Her-Sen Doong, Huichih Wang, and Rob Law, “An Initial Investigation of the Effect of Advertisement and Word-of-Month on First Time Visitors to Hong Kong,” Journal of Air Transport Management, Vol. 14, No. 3, 2008, pp. 159-161. 19. *Her-Sen Doong, Huichih Wang, and Hui-Chi Shih, “Exploring Loyalty Intention in the Electronic Marketplace”, Electronic Markets, Vol. 8, No. 2, 2008, pp. 142-149. 20. Hsiangchu Lai, Her-Sen Doong, Chi-Chung Kao, and Gregory E. Kersten, “Negotiators' Communication, Perception of Their Counterparts, and Performance in Dyadic E-negotiations,” Group Decision and Negotiation, Vol. 15, No. 5, 2006, pp. 429-447. 21. Jen-Her Wu, Her-Sen Doong, Ching-Chang Lee, Tse-Chih Hsia, and Ting-Peng Liang, “A Methodology for Designing Form-based Decision Support Systems,” Decision Support Systems, Vol.36, No.3, 2004, pp. 313-335. 22. Ting-Peng Liang and Her-Sen Doong, “Effect of Bargaining in Electronic Commerce,” International Journal of Electronic Commerce, Vol. 4, No. 3, 2000, pp. 23-48. 1. Her-Sen Doong, Robert J. Kauffman, Hsiangchu Lai, and Ya-Ting Zhuang, “Empirical Design of Incentive Mechanisms in Group-Buying Auctions: An Experimental Approach,”Advances in Management Information Systems, 2008, pp. 181-225. 1. Huichih Wang and Her-Sen Doong, “An Exploratory Study on Consumers’ Attention towards Social Media Advertising: An Electroencephalography Approach,” Hawaii International Conference on System Sciences (HICSS), Hawaii, USA, 2017. 2. Lin, Y. and Doong, H., “CEO’s Tyranny and Firm’s Performance Transparency in Driving Organizational Adoption of IT,” 2016 American Psychological Association Convention (APA), Denver, USA, 2016. 3. Huichih Wang and Her-Sen Doong, “Exploring the Effects of Information Processing Perceptions on Consumers’ Website Advice Continuance Intention,” Hawaii International Conference on System Sciences (HICSS), Hawaii, USA, 2014. 4. Huichih Wang and Her-Sen Doong, “Effects of Online Advertising Strategy on Attitude towards Healthcare Service,” Hawaii International Conference on System Sciences (HICSS), Hawaii, USA, 2014. 5. Shih-Hao Teng, Her-Sen Doong, Hui-Chich Wang and Shulu Hsu, “The Effect of Instructor Brand on E-Learning System Usage Intention,” Pacific Asia Conference on Information Systems (PACIS), Brisbane, Australia, 2011. 6. Yong-Jie Chen, Her-Sen Doong, Hui-Chich Wang and Shulu Hsu, “The Effects of Recommendation Conflict on User’s Adoption Intention toward Virtual Salespersons: A Principal-Agent Perspective,” Pacific Asia Conference on Information Systems (PACIS), Brisbane, Australia, 2011. 7. Her-Sen Doong, Jeffrey C. Tai, and Huichih Wang, “Determinants of Consumers’ E-Loyalty: A Cross-channel Perspective,” Hawaii International Conference on System Sciences (HICSS), Hawaii, USA, 2010. 8. Her-Sen Doong, Huichih Wang, and Chi-Kuang Hsieh, “Effects of Task Types and Communication Support Tools on E-Negotiation Performance: A Task-Technology Fit Perspective,” Hawaii International Conference on System Sciences (HICSS), Hawaii, USA, 2009. 9. Her-Sen Doong and Huichih Wang, “The Impact of Cognitive Styles on the Future Use Intention of E-negotiation Systems,” Hawaii International Conference on System Sciences, Hawaii (HICSS), USA, 2008. 10. Her-Sen Doong, An-Ti Liao, and Huichih Wang, “The Effects of Emotion Strategies on E-negotiation Behavior and Outcome,” Pacific Asia Conference on Information Systems (PACIS), Auckland, New Zealand, 2007. 11. Huichih Wang, Yi-Cheng Ku, and Her-Sen Doong, “Case Study in Mobile Internet Innovation: Does Advertising or Acquaintances Communication Decide Taiwan’s Mobile Internet Diffusion?” Hawaii International Conference on System Sciences (HICSS), Hawaii, USA, 2007. 12. Huichih Wang and Her-Sen Doong, “Validation in Internet Survey Research: Reviews and Future Suggestions,” Hawaii International Conference on System Sciences (HICSS), Hawaii, USA, 2007. 13. Hsiangchu Lai, Her-Sen Doong, and Chen-Yuan Yang, “The Effect of Price Dispersion in e-Market on Consumers’ Intentions to Join Group-Buying,” Hawaii International Conference on System Sciences (HICSS), Hawaii, USA, 2006. 14. Hsiangchu Lai, Her-Sen Doong, Chi-Chung Kao, and Gregory E. Kersten, “Understanding Negotiator Behavior and Perception Based on Negotiators’ Strategies,” Hawaii International Conference on System Sciences (HICSS), Hawaii, USA, 2006. 15. Her-Sen Doong and Yi-Cheng Ku, "A Validation of the Diffusion of Innovation Models in Mobile Devices: An Assessment of Cellular Phones," Americas Conference on Information Systems, Dallas, USA, 2002. 16. Yi-Cheng Ku and Her-Sen Doong, "Diffusion of the Internet Hosts," Americas Conference on Information Systems (AMCIS), Dallas, USA, 2002. 17. Her-Sen Doong and Ting-Peng Liang, "A System Architecture for Applying Intelligent Agents to Support Bargaining in Electronic Stores" Americas Conference on Information Systems (AMCIS), Boston, USA, 2001.